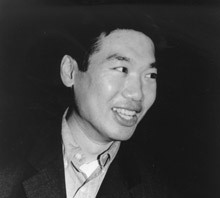 Arnold Chan founded his London-based firm in 1984. Trained as an architect at London's Architectural Association, Chan's innovative and versatile approach to lighting design distinguishes his work, which maximizes the full potential of lighting as a creative tool. His projects include the Grand Opera de Lyon (Jean Nouvel, architect); Calvin Klein, Tokyo (John Pawson, architect); Kenzo, London (David Chipperfield, architect); Philippe Starck-designed Ian Schrager hotels in London (St. Martins Lane, Sanderson), Miami (Delano), and Los Angeles (Mondrian); and numerous restaurants, clubs, and residences. Chan will design the lighting for the Walker's galleries, restaurants, and public spaces. "We want the new addition to be a billboard for life inside the museum," [Walker Director] Halbreich explains. . . . "[Lighting designer Arnold] Chan makes public spaces feel inviting, and he understands the emotion of light. We were looking at how to make the space at times intimate and at times dramatic."